Recently, Jay and I made a major change — we bought a new apartment in Manhattan (YAY)! Totally exciting, but as I have come to realize, it can also be very stressful and overwhelming. I thought that after we finally closed on our place that there would be a sense of relief. But moving out of our old place and moving into our new one is a totally different story. So, as I embark on this new journey, I thought I would create a few lists (as usual) to lessen the stress! Packing up the old memories and moving everything out. Stock up! Make sure to stockpile boxes and tape! Having extra is okay in this case. You don’t want to run out mid packing and have to stop to buy more. Color coding the labels doesn’t hurt either. De-Clutter! There is a lot more extra junk than you would think lurking around (even if you are organized.) Anything that you won’t be able to use in your new space should be donated. You can find a new home for anything like furniture, books, clothing or even a vintage car! If this is the case and you don’t want to sell your car, you will definitely need to organise car storage. With regards to clothes, you can either sell them, store them or give them to charity. Lastly, we realised that this was the perfect time to change our mattresses. We have had our current mattresses for nearly 8 years now, and we thought we might as well go full out and have a new start. Although, it took ages to find the right mattress, after comparing Leesa vs Casper reviews we were able to find the perfect one for us with some help from Review.org! Electronics. Take a photo of what all your devices look like hooked up, that way there are no issues getting your TV set up again (and you don’t have to miss any of your shows) ! If you want to get rid of anything that you don’t really need — try Gazelle or Amazon for trade-in deals. Labels. When you begin to pack, label each box. Make sure to include what’s in it and where it will be going in the new place. That way you or the movers will know exactly where to put each and every box. I also keep a checklist of each numbered box and the contents — that way I can keep track of everything. Pack a bag! You want the essentials with you, so pack an overnight bag for a few nights. That way to you don’t have to sift through boxes to find a t-shirt or your toothbrush. Paint and refurbish. If you need to paint or make any changes to the home do this before you unload the big stuff! There’s nothing worse than getting paint on your favorite curtains and having to spend money on new ones! Unpack. Here the things that you should unpack first! It is also easier to unpack room by room rather then doing a little in each. 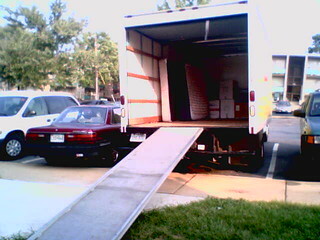 Moving can be easy! If you’re looking to move anytime soon, you could have a look into a company who offers an excellent tailored solution for moving across country in the United States. Which Professions Are Most Productive? This Productivity Tip Will Blow Your Mind Make Conference Calls More Productive!